Today the Central Park Conservancy announced it will partner with the City of New York on a $150 million project to re-envision Central Park’s Lasker Pool and Rink, the well-used facility on the Harlem Meer. This announcement marks the beginning of an extensive community engagement process on this ambitious project, which aims to incorporate a completely reimagined facility into the surrounding landscape, and provide not only skating and swimming, but expanded outdoor recreational opportunities to all New Yorkers. The aging facility — which has long been plagued by systemic problems — would require significant capital investment to continue operating in the near term. Rather than merely repair the facility, the Conservancy proposed to partner with the City on this historic project to completely reimagine the site. 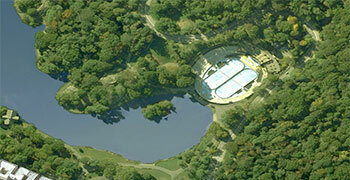 The connection between the Ravine and the Harlem Meer was severed by the construction in 1966 of Lasker Pool and Rink. Guided by the original vision and essential purpose of Central Park — to provide a reprieve to all New Yorkers — the transformation of the site will restore this lost connection and incorporate recreational activities into the landscape. The Conservancy has committed to raise $100 million to fund the project, which will be supplemented by a commitment of $50 million from the City. This historic initiative will be the crowning effort of the Conservancy’s more than 30-year commitment to restoring the north end of Central Park, reclaiming landscapes and facilities suffering from long periods of neglect, including the 11-acre Harlem Meer, the North Meadow Ballfields, beloved playgrounds at East 108th, East 110th, West 110th, and West 100th Streets, the historic fort landscapes on the bluffs overlooking the Meer, and, most recently, the Ravine woodland and picturesque Loch watercourse in the Park’s North Woods. “We’re putting $50 million toward the re-envisioning of Lasker Pool, because parkgoers and Harlem residents deserve world-class amenities and a park landscape that flows the way Olmsted intended it to,” said Mayor Bill de Blasio. 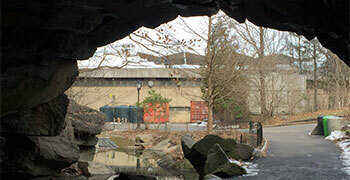 The Conservancy’s close relationships with the Harlem and East Harlem communities date back to the early 1980s, when it worked closely with local neighborhood leaders and residents who participated in the planning of the restoration of the 11-acre Harlem Meer and the construction of the Charles A. Dana Discovery Center, a visitor center that opened in 1994. That project and its sustained management dramatically increased access to Central Park by surrounding communities. “As a beneficiary, along with my family, of the restored Park, I look forward to the Conservancy advancing this current proposed project in the same collaborative partnership with the Harlem community and its other park neighbors that has served as a hallmark of their project design in the past, in anticipation of making this one of the Conservancy’s crowning improvements to the Harlem Meer and Central Park’s northern end,” said Yasmin H. Cornelius, Central Park North Resident and NYS Committee Member #70AD.